Deborah Ravin demonstrating technique during her class. 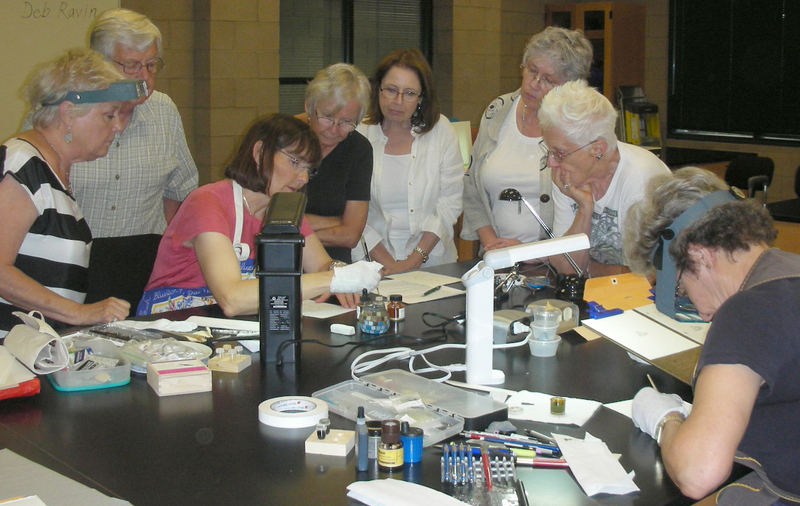 Deborah Ravin taught a BAGSC-sponsored class, August 19 – 21, 2010 at the Huntington Library, Art Collections and Botanical Gardens. Beatrix Potter is well known for her “Peter Rabbit” children’s books featuring her pen and ink/watercolors illustrations, however, Beatrix was also an accomplished botanical artist. Her detailed renderings of fungi and lichens were scientific trendsetters in the era before microscopic photography was an option. 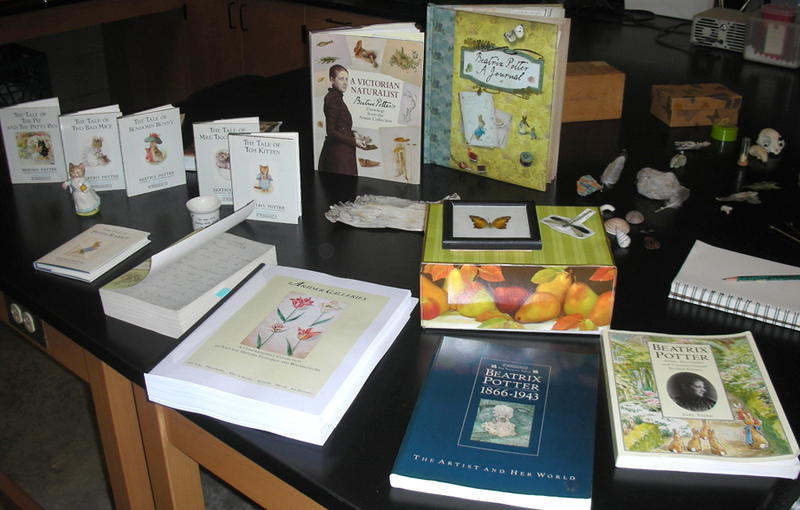 Beatrix Potter’s interests lay with botanical art, particularly in the study of mycology. Her investigation and discovery led her to develop theories expressed in her paper “On the Germination of the Spores of Agaricineae.” (Poculum). Her paper was submitted to the Linnean Society on March 18, 1897. However, her theories, like those of any other woman, were not taken seriously. The paper was withdrawn with the understanding that it needed “more work”. One hundred years later, the Linnean Society wrote an official apology for the sins of historic sexism. Today, 450 of Beatrix Potter’s scientific, archaeological, and botanical art comprise the Armitt Collection in Cumbria. Tania Norris treated us to a close-up of a Beatrix Potter original that is in her personal art collection. 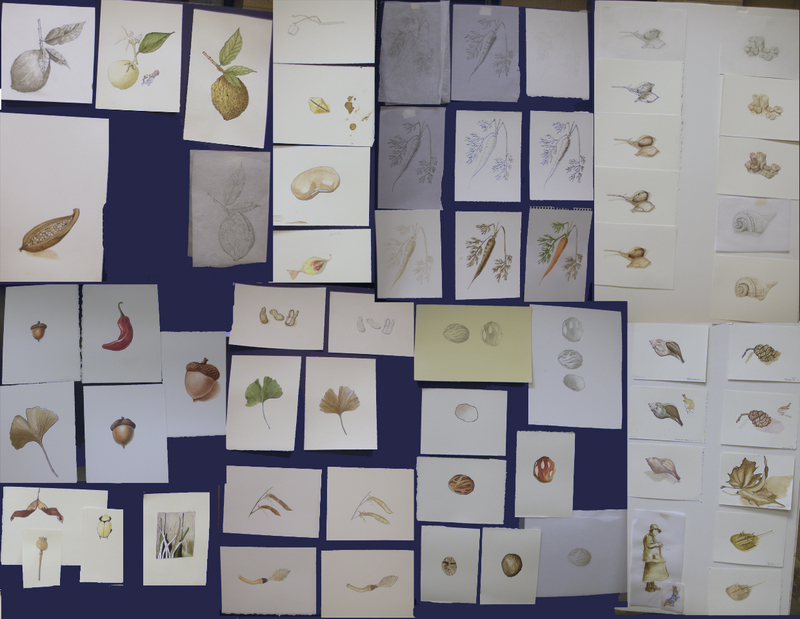 Deborah led us through a series of a variety of methods for applying ink and watercolor to illustrate our botanical drawings. The class featured a treat of afternoon tea with Almond-Cardamom Scones (baked by Jill Carlson to whom we are all very grateful-the recipe is on the BAGSC Blog under the “Recipes” section or can be viewed by clicking the link). Deborah also shared a recipe for “Black Walnut Ink” which is also on the BAGSC Blog (or can be viewed by clicking the link). Our artwork, accomplished during class.